Former Attorney General of the Maldives and President of Maldives Bar Association Husnu Al Suood said on Thursday that the judges at the apex court were working under political pressure. Three judges of the Maldives Supreme Court on Tuesday revoked its order to release nine-high profile political prisoners. One of the points in the February 1 verdict seemed to have prompted President Abdulla Yameen to impose a state of emergency in the country and arrest two top judges. Suood told ANI from Male, "I believe the top court has been compromised. Orders issued by the top court after the arrest of Chief Justice Abdulla Saeed indicate that the rest of the judges are under political pressure". Suood called for an immediate release of Saeed and demanded immediate international intervention to restore democracy in the country. He said, "International community must condemn the government actions against the judges. International organizations must immediately send fact-finding missions to Maldives". The international human rights groups have shown concern over the isolation and helplessness of judiciary in the Maldives. The United Nations Human Rights office tweeted, "We call on the #Maldives Govt to lift the State of Emergency, to respect the institutions & their competencies as provided for in the Constitution, and to respect the fundamental rights of all people and the rule of law." 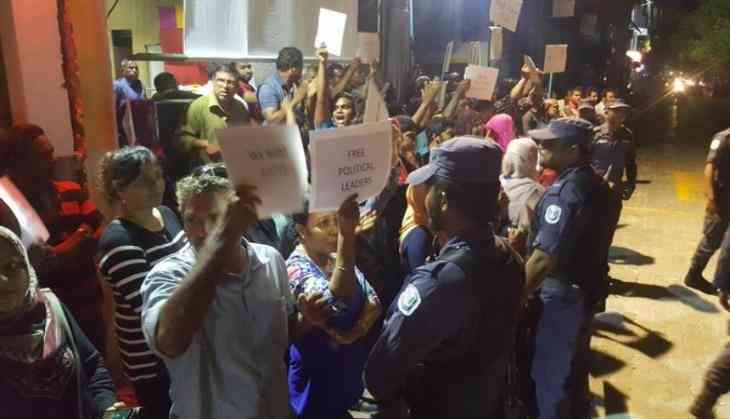 The Maldives has been facing a 15-day state of emergency after President Yameen defied a Supreme Court ruling to reinstall opposition MPs and release political prisoners. Yameen came to power in 2013 in a disputed election that opponents say was rigged. Since then, he has been accused or eroding democracy, cracking down on dissent and jailing opposition leaders.